This year I read all the descriptions of the variety of pumpkins at Whole Foods and selected a Fairytale Pumpkin for my baking needs. 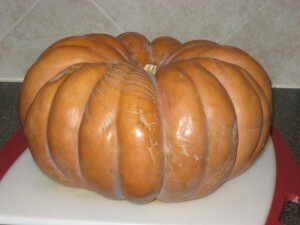 From research on the internet a Cinderella Pumpkin looks the same but has an orange skin. The Fairytale Pumpkin has more of a tan skin. They are both good for baking. I know this looks like a large pumpkin and a lot of pumpkin when you’re finished but there is a lot of water that will be removed in the end. 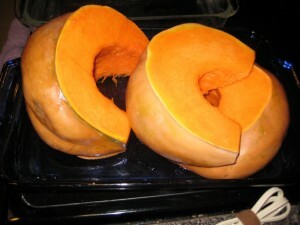 You can freeze your cooked pumpkin for later use. Just think of the endless recipes you can make with fresh pumpkin; Mini Pumpkin Pies, Pumpkin Oatmeal Cookies, Pumpkin Hazelnut Muffins, Pumpkin and Sun-Dried Tomato Ravioli, and any number of pies, cakes, breads, and soups. You can cut large wedges of the pumpkin for baking. 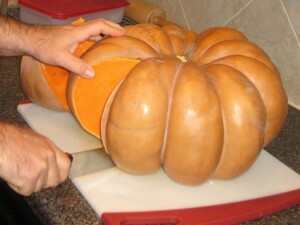 Put your pumpkin on a solid cutting board. 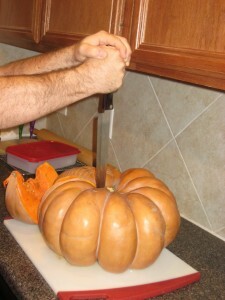 Place a strong, sharp knife vertically in top of pumpkin. 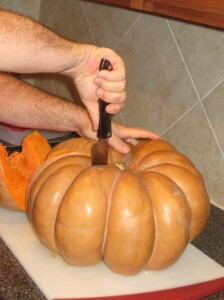 Slide Knife all the way into the pumpkin, keeping it vertical so the tip goes to the base on the pumpkin. 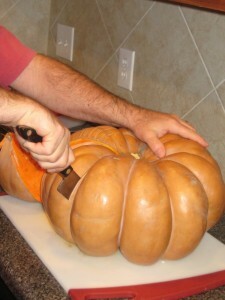 Pull knife straight down through the pumpkin, keeping the knife tip in the center of the pumpkin. Continue all the way down with knife and slide wedge out. Repeat. When all wedges are cut, chop off the stem. Scrape seeds, rinse the pumpkin off and lay in baking dishes. It’s okay if they overlap. Put the seeds into a large bowl for roasting later. You can also put the wedges on baking pan but be sure it has sides because water will come out of the pumpkin as it bakes. 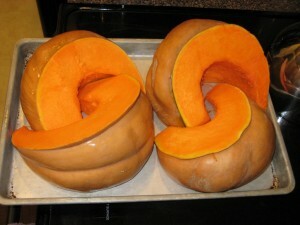 Cover pumpkin wedges tightly with aluminum foil and bake in a 400°F/200°C/Gas Mark 6 oven for 90 minutes to 2 hours. 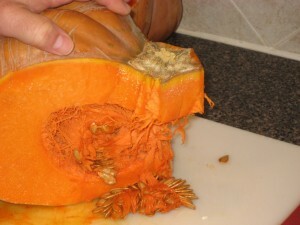 Pumpkin is done when a fork slides easily through the thick part. Let the pumpkin cool so you can handle it. Line a colander with a tea towel. 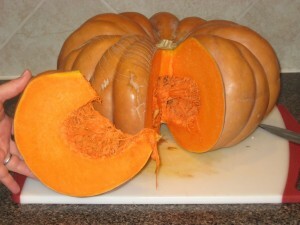 Use a large spoon and scrape the pumpkin out of the shell. Place it in the tea towel and let it drain. You can wrap the tea towel around the pumpkin and pick it up to squeeze. After you get most of the water out of the pumpkin move it to the large bowl of your food processor and blend until smooth and creamy. 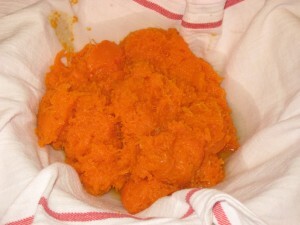 If the pumpkin is runny and looks like it still has water in it place it back in the tea towel to drain more. Finished pumpkin should be thick and hold it’s shape. If you leave water it in your finished product will be too runny.